1,405 people potted a plant on Saturday. Shane Runyon perfomed and crowd shots were taken for his new music video. In order to break the record the plants had to be potted within 60 seconds, and then watered. Participants in the attempt raced to complete the record. 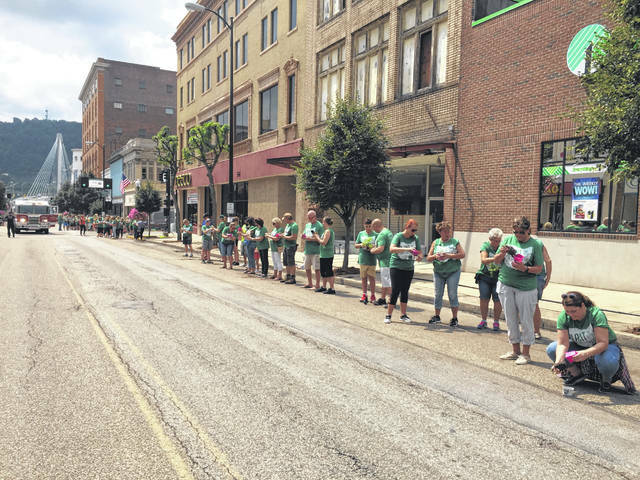 The city of Portsmouth went down in the books on Saturday when hundreds of people lined Chillicothe Street and successfully broke a world record. With a representative from Guinness Book of World Records on site to officiate, the record for most people plants potted simultaneously was broken with 1,405 participants, knocking out the previous record of 500. The attempt was just one part of the Plant Portsmouth event, organized by The Friends of Portsmouth group and Chairperson Jeremy Burnside. The event sought to bring together hometown proud individuals who wanted to put Portsmouth on the map as a city that was taking a step in the right direction, and wanted to change the conversation about the area. 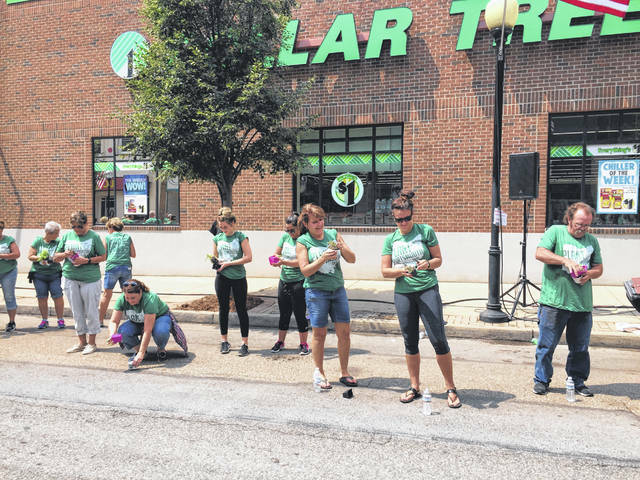 The event brought in over 500 volunteers to assist in a giant cleanup effort of Chillicothe and Market Streets, which came together to paint light posts, power wash business fronts and sidewalks, and staining brick, among other projects. 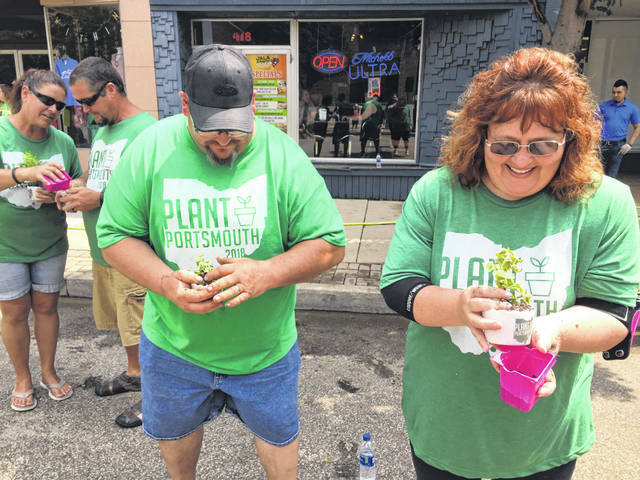 With the overwhelming support of the event from local businesses, Plant Portsmouth raised $75,000 to go towards beautification efforts, while ticket sales from volunteers launched them over the $100,000 mark. Additionally, a new group of the first ever Town Ambassadors were introduced who will make it their mission to see that Portsmouth continues on the right path. In the last speech before the attempt was made, Burnside said that it was time to take matters into our own hands to help out the city. “It’s because our city needed us. Our leaders needed us,” said Burnside. Burnside also extended his thanks to all those who came together to make the event possible, such as city manager Sam Sutherland and Jack Tackett. 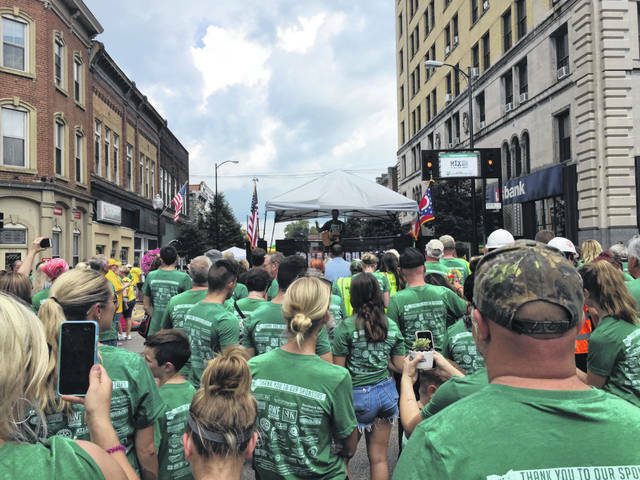 After the attempt was successfully completed, the crowds gathered for a live performance by local country music artist Shane Runyon who filmed crowd shots of the event for his new music video. At the conclusion of the event, an awards ceremony was held at Tracy Park.